Ultimately, it’s all about temperature. For all of their technocratic complexity, the negotiations in Paris over the past two weeks have a singular goal – keeping the average temperature of the earth’s atmosphere from climbing into a range that would dangerously disrupt the climate system. As recent temperature statistics and scientific assessments have underscored, achieving that goal will present daunting, historic challenges on a scale that humanity has arguably never confronted. 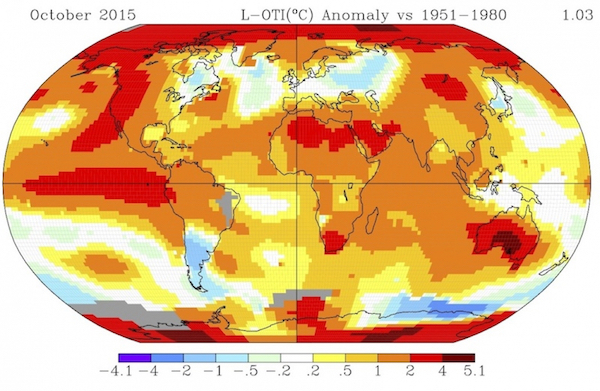 Scientists say harmful, human-caused climate disruption is already occurring in many ways. The pollution-driven warming trend that’s creating it is already half-way to the line that negotiators set in 2010 as the limit for preventing a dangerous temperature increase. Furthermore, the latest, perhaps next-to-final, draft of a Paris agreement included language indicating negotiators may set an even more difficult temperature goal than the 2010 limit. 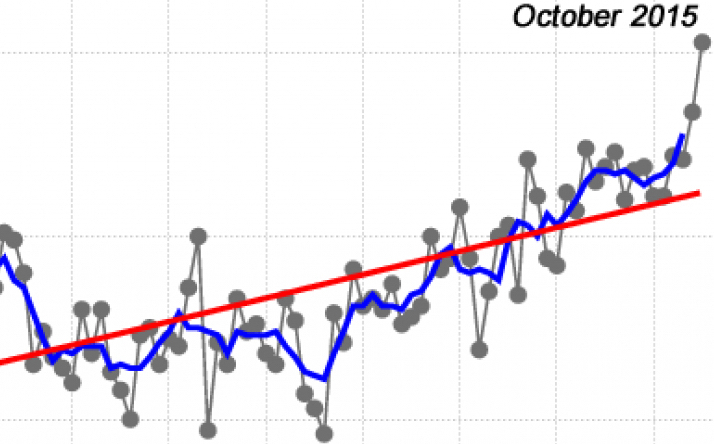 Evidence of a warming Earth has continued to accumulate in just the past few weeks. The World Meteorological Office (WMO) and other authoritative climate bodies announced that based on readings since Jan.1, 2015 would almost certainly be the warmest year on record – that is, since the late 19th century. They also said that by year’s end, the earth’s average temperature will almost certainly have increased by a full 1 degree Celsius (1.6 degrees Fahrenheit) above the the “pre-industrial level” around 1750 – halfway to the 2 degrees C (3.6 degrees F) limit set in international negotiations in 2010. 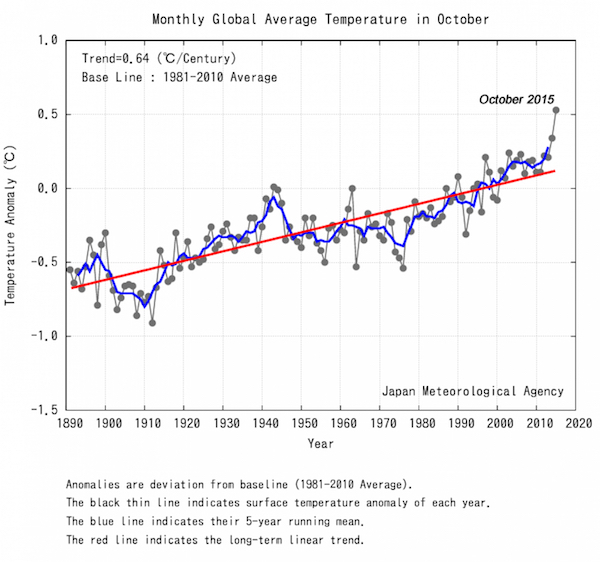 A week later, NASA and the Japan Meteorological Agency announced that their readings and analyses indicated October was the warmest October on record worldwide – with the biggest upward jump in average temperature for any month in the 135-year-old meteorological record. Texas’ record-breaking heat wave and drought of 2011 was one of those events, illustrating scientists’ conclusion that warming-induced climate disruption is not just a future projection. As TCN reported in 2012, three studies had attributed a part of the extreme conditions in the state in 2011 to human influence. One study was co-authored by John Nielsen-Gammon, the Texas state climatologist and regents professor of atmospheric sciences at Texas A&M University, who told TCN at the time that it had detected “a significant global warming contribution” to the heat and drought severity in 2011. “…[E]ssentially, we would have broken the record with this drought in terms of high temperatures even without climate change, but we ended up breaking it by quite a comfortable margin with climate change,” he said. With its estimated $7.6 billion in agricultural losses, millions of dead trees and wave of devastating wildfires, the 2011 situation in Texas undoubtedly qualified as “dangerous” to some, even with the global average temperature not halfway to the internationally agreed limit of 2 degrees C.
A 2-degree C limit for avoiding “dangerous” climate change was first suggested by an economist in the 1970s and eventually gained favor over years of discussions among scientists, other experts and policy makers as a mechanism for reducing heat-trapping greenhouse-gas pollution. This 2-degree C warming target is perceived by the public as a universally accepted goal, identified by scientists as a safe limit that avoids dangerous climate change. This perception is incorrect: no scientific assessment has clearly justified or defended the 2-degree C target as a safe level of warming, and indeed, this is not a problem that science alone can address. Prompted by new scientific findings and the urgings of particularly vulnerable nations, like island states, among others, the draft of a Paris agreement distributed Thursday included language that would call for keeping an average temperature rise “well below” 2 degrees C and suggested an even lower, more difficult goal of 1.5 degrees C might be included in the final pact, as least as an aspirational target. Either number would be extremely challenging to achieve. The agreement being negotiated in Paris is based on voluntary emission-reduction pledges by 185 nations that would, combined, mean the 2-degree C limit would be exceeded, different teams of experts have concluded. A Washington-based nonprofit research organization calculated the pledged emissions cuts would mean a temperature rise of 3.5 degrees C, leading to impacts including vast melting of the polar ice caps and a large amount of sea-level rise. A European research coalition estimated a 2.7-degree C rise with the pledged reductions. Because of this problem, negotiators have been aiming for an agreement with a mechanism for periodic revisitation and strengthening of the pledges to achieve greater emissions reductions. The move from a 2-degree C to a 1.5-degree-C consistent world will be achieved mainly through additional reductions of CO2. This implies an earlier transition to net zero carbon emissions worldwide, to be achieved between 2045 and 2060. Energy efficiency and stringent early reductions are key to retain a possibility for limiting warming to below 1.5 degrees C by 2100. The window for achieving this goal is small and rapidly closing. In June, a group of more than 70 experts from a number of scientific bodies reported to international negotiators in the run-up to the Paris conference about the adequacy of the 2-degree C goal to meet the 1992 goal of avoiding “dangerous” climate change in light of scientific findings. Experts emphasized the high likelihood of meaningful differences between 1.5 degrees C and 2 degrees C of warming regarding the level of risk from ocean acidification and of extreme events or tipping points, because impacts are already occurring at the current levels of warming; risks will increase with further temperature rise. In particular, [the experts] indicated that the difference in projected risks between 1.5 degrees C and 2 degrees C of warming is significant for highly temperature-sensitive systems, such as the polar regions, high mountains and the tropics, as well as for some other regions, in particular low-lying coastal regions. The [Intergovernmental Panel on Climate Change] further stressed that regional food security risks are significantly different between 1.5 degrees C and 2 degrees C of warming, pointing to the example of Africa, where in some countries the reduction in staple crop yields is projected to be higher than the global average. Most terrestrial and marine species would be able to follow the speed of climate change; up to half of coral reefs may remain; sea-level rise may remain below 1 meter; some Arctic sea ice may remain; ocean acidification impacts would stay at moderate levels; and more scope for adaptation would exist, especially in the agricultural sector. With global temperatures already close to 0.8 degree C above pre-industrial levels, a 1.5-degree C target would correspond to twice the climate change that has already happened and a 2.0-degree C target would correspond to not quite three times the climate change that has already happened. For local impacts outside of sea level rise (which takes much longer to develop and stabilize), the difference in goals is less than the magnitude of climate change already experienced. 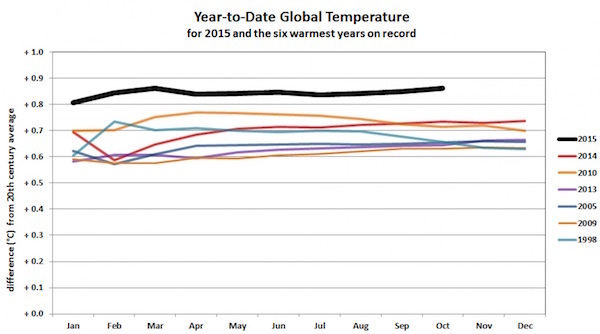 Climate models don’t do as well with regional changes as with global-scale changes. At a regional scale, it’s harder to tell how much of the climate change so far has been amplified or masked by natural variability. This makes regional manifestations of future climate change doubly uncertain: we don’t know as well what the local pace of manmade climate change should be, and we don’t know very well what the current baseline is for natural climate. John Nielsen-Gammon is a member of TCN’s Advisory Board, serving solely in his capacity as regents professor of atmospheric sciences at Texas A&M University. The Advisory Board’s volunteer members have no authority over TCN editorial decisions.